I've lived in the United States for 4 years, 7 months and 8 days. The first two can occasionally be found within the walls of an international grocery store, while the latter - in the Midwest - can scarcely be found outside of Chicago. In England, of course, it's different. Citizens can hop on a train (relatively cheaply, if they book in advance) and arrive in virtually any town or city within a few hours. Granted, England is a considerably smaller place than the United States and crams some 53 million people into what is a smaller area than Florida. But Great Britain's transit system is nonetheless a model that America would do well to emulate. 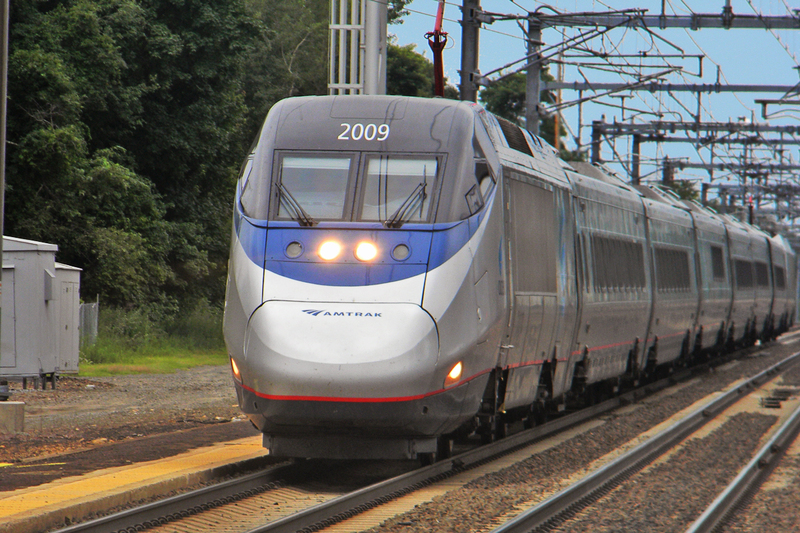 In recent years, there have been efforts by legislators to introduce inter-connecting railways in various corridors across the United States. Indeed, what would eventually become central to these plans is the Midwest Regional Rail Initiative, which would link together the states of Illinois, Indiana, Minnesota, Wisconsin, Michigan, Ohio and possibly Kentucky. This is all well and good, but such discussions nearly always end in gridlock. Referendums - as was the case in Florida - are often disregarded by state-based decision makers. And many of the people who would benefit from a transit system are the very same people who are concerned that it would force their taxes to skyrocket. The truth is, America needs to bring back a nationwide transit system. In such an expansive country (the United States has a total area of 9,826,675 square kilometres), it is unfathomable that an interconnecting passenger rail service is not competently being sought out by those in power. In its current state, America is a difficult place to navigate without some sort of motor-vehicle. Whether you are commuting to work or visiting family members two counties over, you're most likely going to need your own vehicle. The problem with this is that ownership is so expensive. The average cost of a new car is around $30,000, while maintenance costs such as gas and general/emergency repairs can drain thousands from your bank account each year. However, in New York City, where the cost of living is high, a monthly rail pass for the New York City Transit is $112. It would likely be half this in most cities in America. In other words, instead of paying many thousands of dollars per year just to use a car, you could be paying between $600 and $1300 to commute by train. When I first moved to the U.S., I was startled by the number of people I encountered who spoke of 50-mile work commutes. Little did I know that I would become one of those commuters. I can tell you from experience that driving an hour (or more) to work is not fun, but the point remains that thousands - possibly millions - of Americans commute huge distances everyday. Not only would a dot-to-dot rail service lower gas expenses for these commuters, but it would allow them to reach their destination much faster and in greater comfort. As I touched upon earlier, America is a vast country. I commonly speak to people who have friends and relatives scattered from coast to coast, from the Great Lakes to Florida Keys. Out-of-state commuting is almost always negotiated in one of two ways: 1) flying or 2) driving. The problem with flying is that it can be costly: a round-trip flight from Indianapolis to New York City can cost anywhere between $300 and $600. Driving long distance, meanwhile, can take twice as long as the train - particularly high speed rail. For those of you who are hellbent on voting down railway proposals, keep in mind that traffic congestion would be alleviated considerably if a comprehensive rail network was introduced. So even if you never step foot on a single train, a successful transit system would benefit you more than you could know. The introduction of a vast, inter-connecting railway could not be achieved by the waving of a magic wand. Construction and maintenance of just a single line would require countless skilled construction workers and engineers. America's unemployment figures - which are only now starting to improve - would be helped along a great deal by the creation of thousands of environmental jobs. It's a sad statistic, but the truth is that over 30,000 Americans die on the road each year. While it should be noted that the motor vehicle fatality rate has halved since the 1970s, the fact remains that 3 times as many people die per 100,000 inhabitants in the USA than in the United Kingdom. Obviously there are a number of factors involved in this grim statistic (for a later post), but giving residents the choice to travel by rail can only have a positive effect. This might be the most important reason of all. Amid the stresses of an early morning commute or a long journey out west, instead of holding tightly to your steering wheel or watching diligently for swerving traffic, you could be sitting back, watching the American landscape, which is among the most varied and beautiful on the planet, go by. As someone who has traveled by train a considerable amount, I can tell you there are few better places to daydream. If only more people would daydream about the image below. The issue is geography and American stupidity that values the independence of the car over the use of community public transit. You're right, it's great in Britain to hop on the train and be in Scotland by dinner. The problem is that Indiana is roughly the size of Britain and there's no where worth going on a 6 hour train journey too (though Indy is nice). Massive public transportation projects require federal money and state cooperation, both lacking these days since most state governments can't see the woods beyond the trees. I think the bellwether will be the California High Speed Rail project, which is happening whether anyone likes it or not. If it's a success and cuts internal flights in California, then it will be harder for politicians to argue against such projects in other states. On a local level, using Chicago as an example, the public transportation is so full of cronies and mis-spent money that any argument for more public transport is met with derision because what we have is already so poorly run. Up here in Northwest Indiana we have a commuter rail line into Chicago that's been around for almost 100 years. It pays for itself, fares are pretty good and when I used it, it was pleasurable. The South Shore Line is awesome. For YEARS they've talked of expanding the line to two other major cities in Northwest Indiana. I live in Valparaiso, and a lot of people here work in Chicago, so to commute, they either need to drive 40 minutes to the nearest train station or drive 1 hour into Chicago, guess which they choose? So, a few years ago, they started a daily commuter bus service from Valparaiso (partly paid for with Federal largesse). The logic was that if enough passengers use the bus line, it will justify the cost of running trains to Valpo (where the track ALREADY exists). Well, guess what, the bus is now so popular, they run 4 buses a day to Chicago from Valpo. And all local taxpayers do is complain about how much it costs. And guess what? We're no closer to having that rail line. They're just going to keep adding buses. This is America. It's an absurd place. I totally get all that. There are vast stretches of land with absolutely nothing to offer, and so why would anyone go there? But virtually every state in the Union has somewhat of a fairly big city that a rail line could run through, with the wider goal being an interconnecting service that spans the entire country. Yes, the California High Speed Rail project will be an interesting experiment. Actually, high speed rail is key in general to this working. People say "the country's too big, it'll never work". With trains that travel at 150mph, the country would become that little bit smaller. >> The issue is geography and American stupidity that values the independence of the car over the use of community public transportation. >>This is America. It's an absurd place. I know, such an absurd place. Poor you. Please sort out the difference between the UK, Britain and England! I agree, and there are passenger rail services, but it's my understanding that they defer to freight trains. Plus, they are very expensive and SLOW. And where I live (southern Missouri) I would have to drive three hours just to get to a station. Three weeks in England, Scotland, and Wales riding the train everywhere from everywhere, with coaches everywhere to pick up the slack, made me really appreciate mass transit. When I got back and had to drive across town to work, I was very unhappy. I even missed riding the tube in London at peak time! I wonder if when some Americans think of High-Speed Rail they can't see past the current rail network (which is actually slower on average than it was the 1920s), and can't visualise it being faster than air travel. Most journeys of around 300 miles would be made quickest on a High-Speed train. London to Paris is 307 miles and takes 2hours 15mins on the Eurostar. The plane only takes an hour but the nightmare of check-in means the full journey time is greater. And much less convenient.